Here’s a healthy version for a timeless cake from New Zealand – Sugar-Free Gluten-Free Louise Slice! This recipe is very easy to make and even easier to enjoy with family and friends. Read on to find out how I made this timeless favourite deliciously sugar-free and low-carb. Louise cakes were rumoured to have been named after the daughter of Queen Victoria in the 1800s – Princess Louise of England. Others think it may have been named after Princess Louise’s wedding cake. Brought to New Zealand by British settlers, the recipe has been used throughout the centuries and is still being made in today’s kitchens – like mine! It is typically made with a thin base layer of cake or biscuit crumbs topped with raspberry or plum jam, coconut meringue; then baked in a rectangular pan in the oven and cut into squares (hence why it’s called a “slice” rather than cake). Families across New Zealand will have made their own family recipe for years, and all these different versions in the long span of time makes the cake slices all the more special. 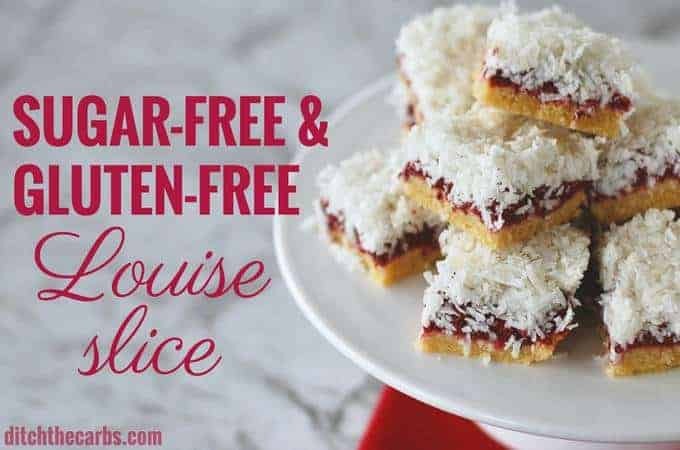 You can enjoy this sugar-free gluten-free Louise slice for any occasion like anniversaries and parties – and you can even pack a square or two in your lunchboxes for school and work! And of course, Louise slice is always to be found at a school bake sale – so bring a healthy sugar-free gluten-free Louise slice instead. Making a healthier version of a recipe that can be dated back to the 1800’s shows that we don’t have to deprive ourselves of old-time favourites. This recipe has been long-engrained in New Zealand’s culinary history that it must be made available to all Kiwis living around the world who want to stay healthy, sugar-free and gluten free. Making a sugar-free gluten-free Louise slice – or of any dish, for that matter – was far from the imaginations of its originators, but I bet that they would enjoy this healthier version nonetheless. Like my other desserts such as no-bake lemon cheesecake and low-carb carrot cake, this healthy low-carb Louise Slice has no added sugar – without having to skimp on taste! Just because a cake is sugar-free doesn’t mean that it takes excitement and taste from it. Going on a sugar-free diet benefits our bodies by lowering the risks of illness and disease; keeping the cravings at bay; making you feel more energetic and so much more. 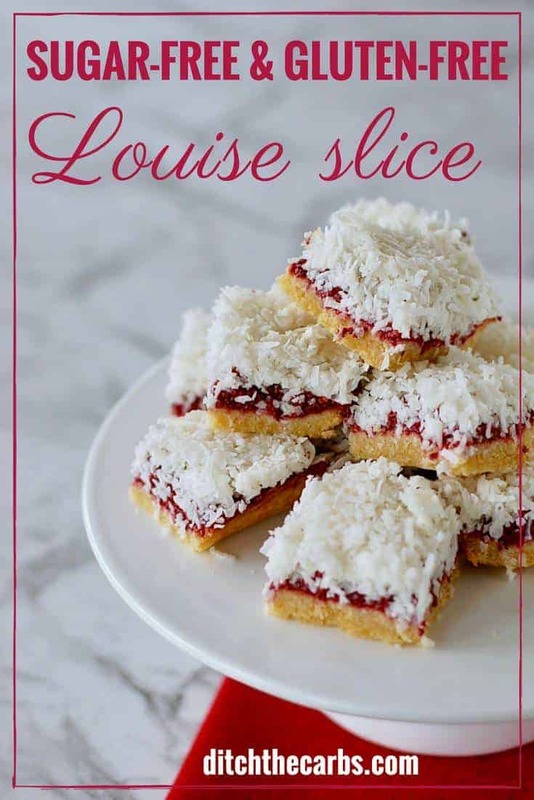 As well as being sugar-free, this delicious Louise slice recipe is also gluten-free! Gluten is a type of protein that can be found in many grains and flours – which is a big no-no if you’re going on low-carb. Although gluten aids in maintaining the elasticity of the food it’s in and makes them chewier, it is worth giving it up entirely. Click here to read my article on Gluten free vs Grain Free. Giving up on grains (and therefore gluten) greatly improves your digestive health and helps with healthy weight-loss and appetite control, for starters. And because grains (and gluten) can be found in so many ultra-processed and unhealthy junk food, you’ll be sure to eventually eliminate these nasty products from your kitchens when living low-carb. And again, you can still enjoy food that is made gluten-free like my low-carb lemon cupcakes and my flourless berry sponge. Healthy sugar-free gluten-free Louise slice. 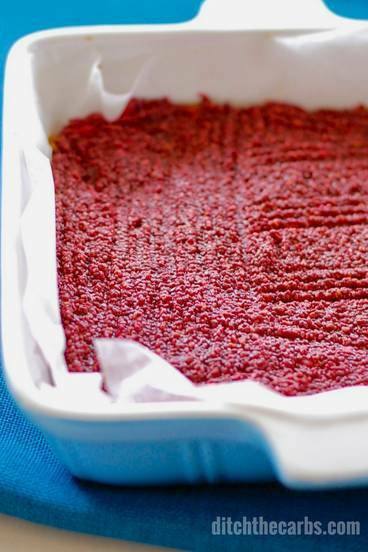 Healthy sugar-free gluten-free Louse slice the kids will love. With a sugar-free chia jam filling, these will be a hot with all the family or your next birthday party. I would suggest making the sugar-free chia jam the night before, or at the beginning of this recipe, so it has time to swell and thicken. Mix all the ingredients together. Press into a square baking dish (20x20cm, 8x8inch) that has been lined with baking parchment. Bake at 180C/350F for 10 minutes, or until golden. Remove from the oven and allow to cool completely. Place all the ingredients in a bowl and mix well. Allow to set for 20-30 minutes. Chia seems to vary considerably so it may take a little longer to set, or may require an extra tablespoon of chia seeds. 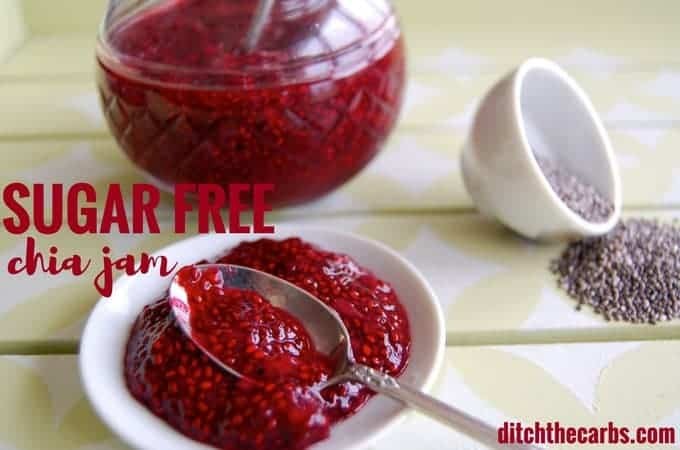 Gently spread the sugar-free chia jam over the cooled cooked base. Place in the fridge to set further. Mix the coconut, sweetener and melted coconut oil together in a bowl. 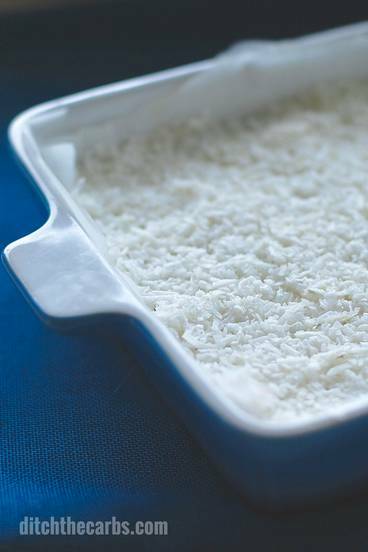 NOTE: Depending on how much moisture is in your shredded/desiccated coconut, you may require an extra tablespoon of coconut oil to ensure the coconut layer sets. To test, squeeze a little handful together. It just needs to hold together for a second, it will set hard in the fridge. But if it is completely crumbly, add extra coconut oil which is the binding agent. Spread gently the coconut layer on top of the chia jam layer. Place in the fridge to set completely. May be frozen as individual squares in an airtight container which has been lined with baking paper. Discover how to give up sugar for life! Sign up for my FREE 5 day mini email course and newsletter. « Are You Feeding Or Fasting? I’m afraid I don’t a have a similar recipe to this that is nut free, but I do have an entire list of coconut flour recipes or recipes that have their adaptation instructions to use coconut flour instead. Click here to take a look. Do you think coconut flour could be substituted for the almond flour? Coconut flour and almond flour work in completely different ways. You may want to read this Ultimate Guide To Coconut Flour vs Almond Flour. I made this last night. We are enjoying it with our coffee today. I only got 9 squares from the 8×8 dish. Next time I will add a bit more swerve to the fruit/chia layer and use less coconut on top. It is a tasty treat. This sounds amazing. Will make it this weekend. 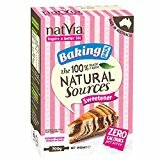 Have you heard of Australian “Lamingtons”? They are a little square yellow cake which are then dipped in melted chocolate and then in shredded coconut? Hoping you have, and you would consider remaking this long-time loved sweet from all my birthday parties in Sydney. Thanks for your inspiration every day! My husband complains about the chia seeds getting stuck in his gums. Is there a substitute I could use? I found sugar free chia jam at the store. What is the equivalent for store bought instead of home made? I can’t really give you an accurate measurement as I don’t know how thick or spreadable your chia jam is. Be guided by your baking instinct. The jam is the filling, so enough for flavour, not too much so the layers don’t stick together. what are this meaasure ???? I’m sorry, I don’t quite understand your question. If you prefer not to use metric measurements, there are buttons below each recipe where you can switch between metric and cups. There is nothing that is 8ml in this recipe. Hit reply and let’s see if I can figure this out for you. 50g means 50 grams and 80ml is 80 mililitres or if you change the measurements you will see it is equivalent to 1/3 cup.